Do you know your style? 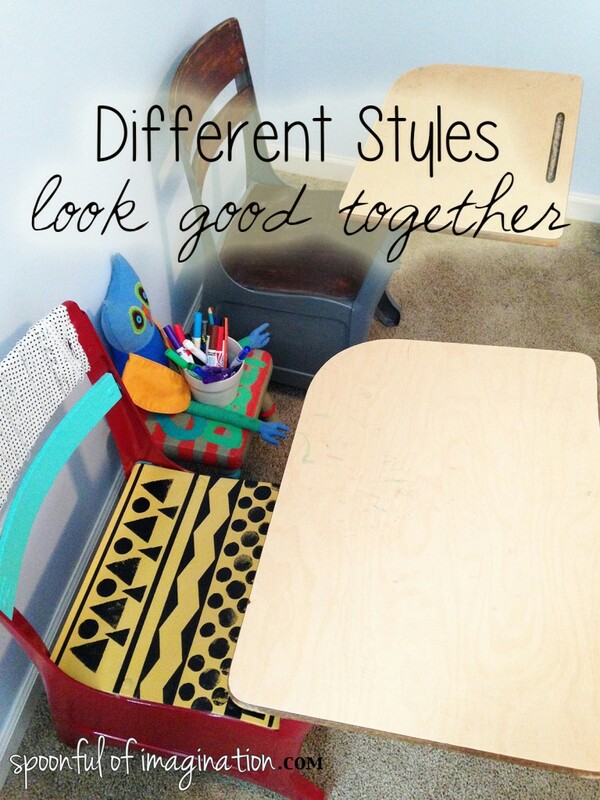 Although I feel like I know mine, so many different looks, patterns, styles do appeal to me. I hope I take parts of them all and kind of just make my own. If you like a modern lamp. It does not necessarily mean your style is modern, right? Let’s say that we can make our own style by just filling our homes with things we love. I love rustic and I love bohemian, so some may say my style is rustic bohemian. I know I have said that, but what would this desk be called just in its normal state? Is it vintage? I liked the way it was. Which is very different from my last school desk makeover. So, I decided to keep this makeover a little simpler and go with the look it already had, except of course add a small punch of color to make it more me. Is that bohemian vintage style then?! 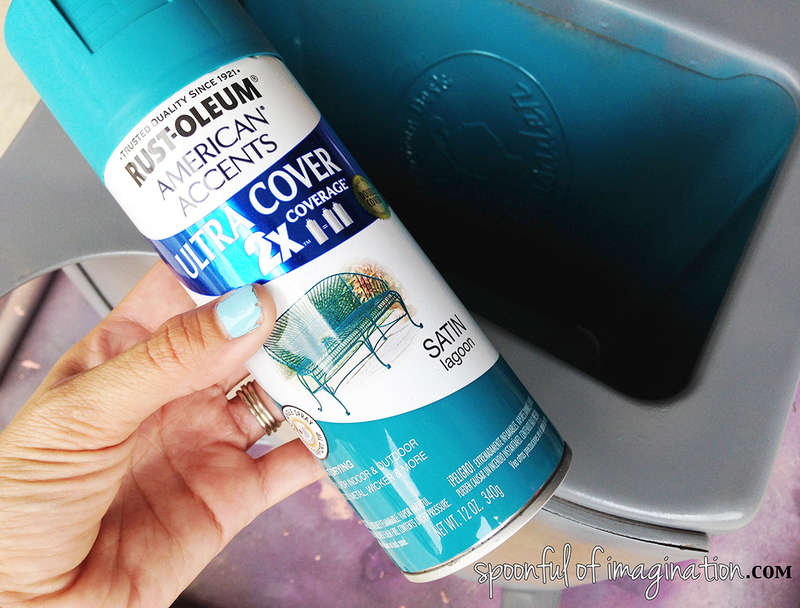 I spray painted the whole base with a gray spray paint, but then I used Rustoleum’s Satin Lagoon to spray on the inside. I love this deep teal color, and I have been waiting for something to use it on ever since I bought it at the beginning of the summer. My tips on spray painting one of these desks is to just be patient. 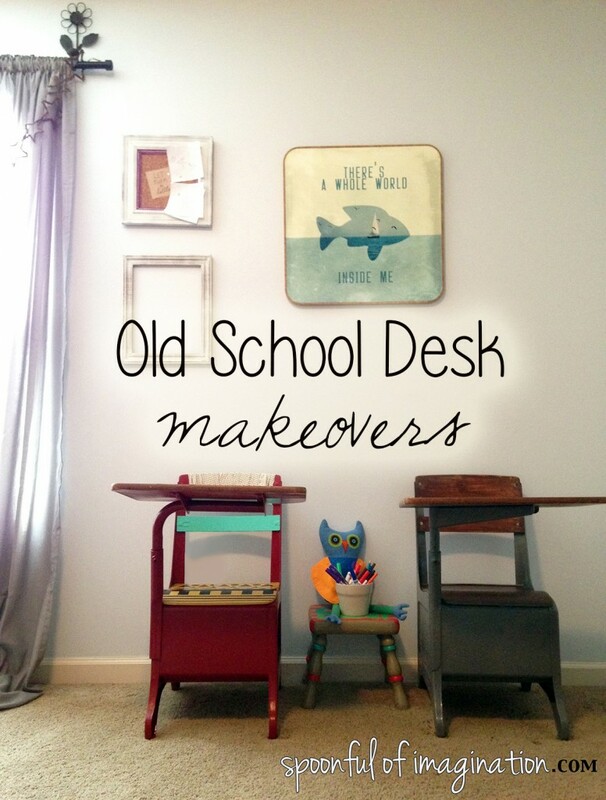 I kept flipping and rotating my desk so I was always spray painting down. I didn’t want the paint to run and drip down the sides, and this rotating technique helped prevent that from happening. Next, I sanded the seat to get a lot of the spray paint off. I left a little to add a rustic charm, but I got off the obvious thickness on the edges. 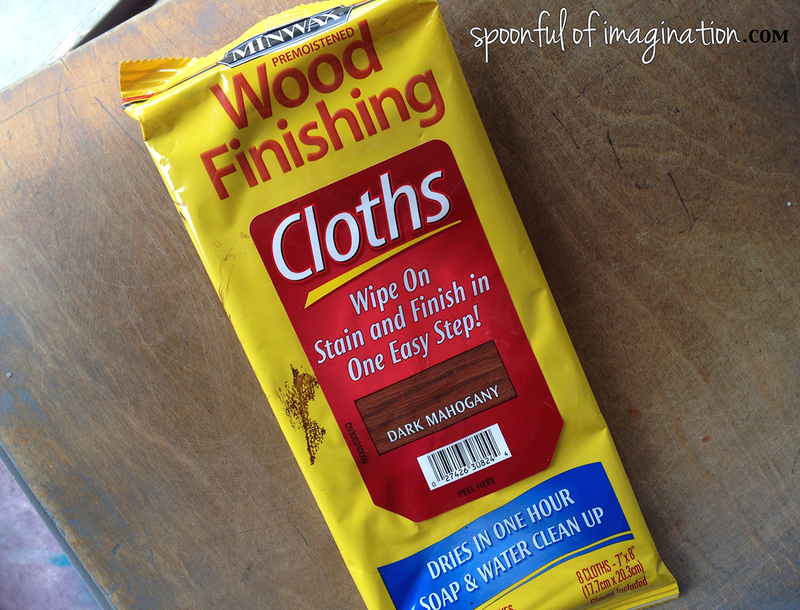 I was so excited to try my Minwax staining wipes that I received as part of my Haven Conference swag next. 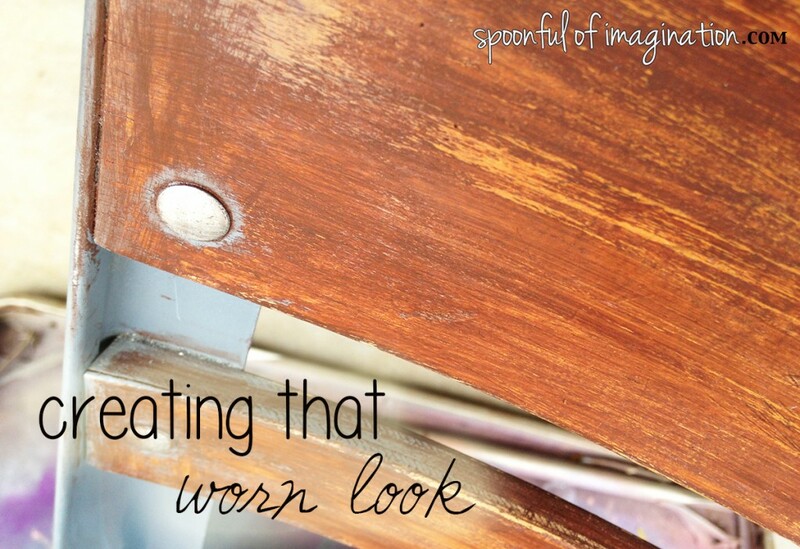 I just wanted to darken the seat up a little to what it may have looked like in its prime. So, I used a wipe and covered the seat really well. I found that these wipes were perfect for this small project, and they helped me cover the side of the seat-even in the small groove notch. 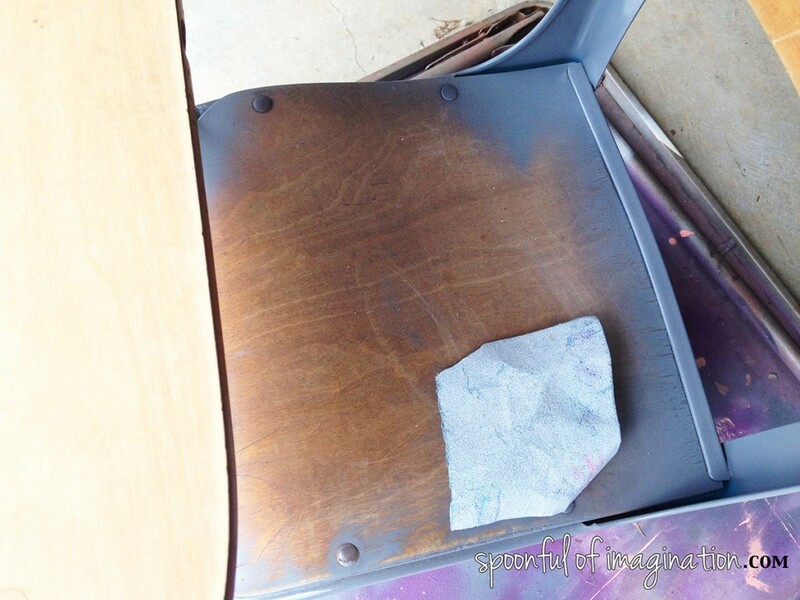 After I covered the seat well with the stain wipe, I used an old t-shirt and started rubbing some stain off/in. 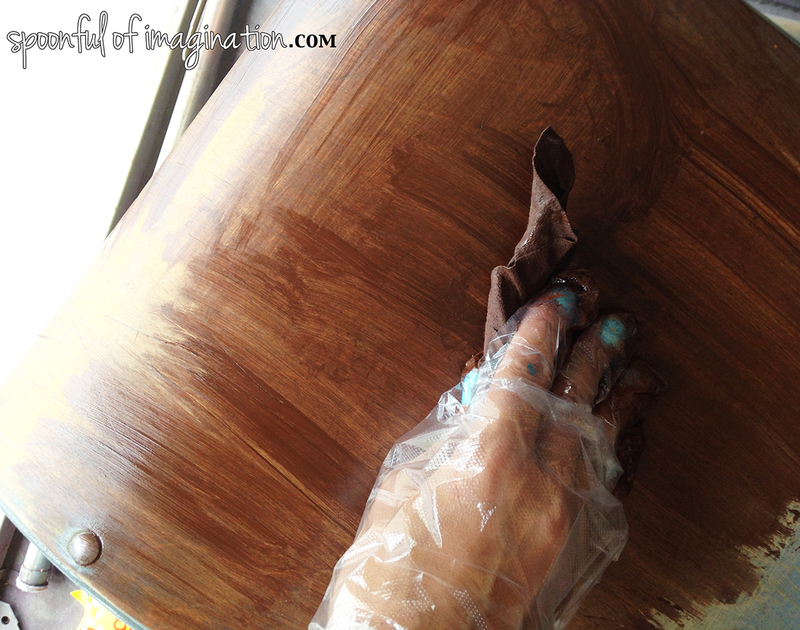 I wanted to add a deepness of color with the stain, but also show variation and not allow it to look perfect. In some areas, I rubbed most of the new stain off, and I love how the balance of old/new stain look together. Once the stain dried, my desk was done. 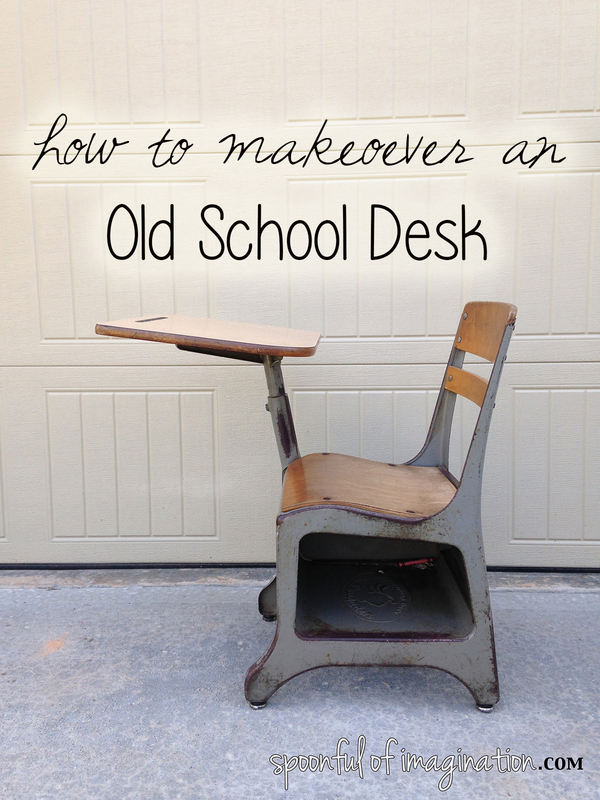 It was so much easier than my tribal pattern seat school desk. 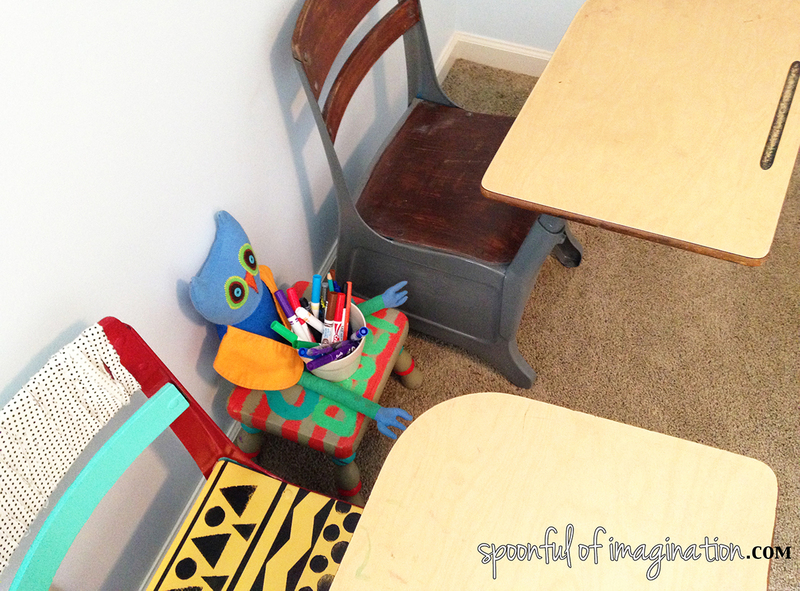 I was left questioning which desk I liked more! Truth be told, I like them both! They are different. One is bold and fun. The other is a staple neutral. When they are paired together…I love the balance of fun and quirky with timeless. They are definitely different styles. Which one appeals to you more? Do you have a wide taste of things you like as well? I love how they look in our school room. 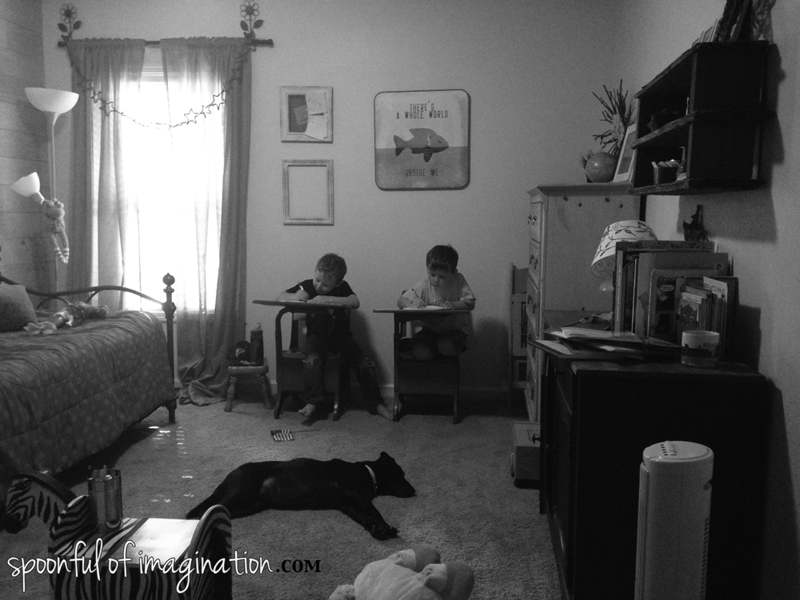 I am often on the floor, and the boys bounce back and forth from their desks to the day bed. Do you remember what this room was created for? 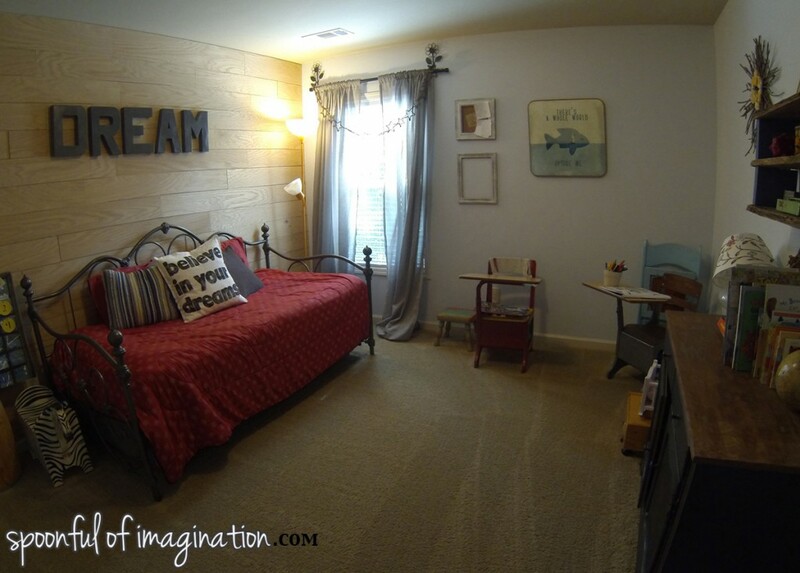 It was our foster care bedroom. I am still not use to calling it our foster son’s room. I miss all his little things in there. I will tell you more of why this room is no longer the “foster care” room soon. First, I have to leave you with a real life picture of how this room usually looks. I am so blessed to be able to have them home, learning and living life together. Just like my broad taste in styles, these two have a broad contrast of personalities. I often wonder who is teaching more. They teach me so much everyday. 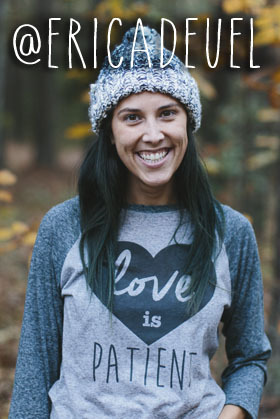 Imagine what happens when we go with our gut, who we are, what we like, and create a place of love by the uniqueness we all have? Life is beautiful. Keep imagining friends!